While living in the Notting Hill area of London in 2000, I dated a girl who lived in Islington. Every wintry, late Sunday night for months I would travel from the North to the West on the tube, always stuck waiting on the outside platforms of Edgeware Road Station. Mostly I would be alone in the station as the wind whistled through, freezing in a jacket that was not equipped for those tunneled blasts of cold air. At that time, I was still using a discman with a handful of CDs in my bag for the journey home. 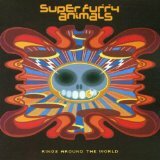 One disc that I remember specifically from that time was Super Furry Animals’ Guerilla. I bought it at HMV in one of their 2 for £20 promotions. While I never fully committed to loving it, the album definitely had its share of highlights including “Do Or Die”, “Wherever I Lay My Phone (That’s My Home)”, and the firm favourite of “Northern Lites” which would get replayed several times. I haven’t really dipped too much further into SFA’s collection even though nearly every release lands them much critical acclaim and a guaranteed spot in many yearend polls. Last year I finally got around to picking up Rings Around the World. I didn’t know any of the songs, except that as usual, they were well received upon release. A year after buying it, I just got around to listening to it. Much like Guerilla, to these ears it has its moments. “(Drawing) Rings Around The World” is a catchy sing along that I’ve had in my head for days. “Sidewalk Surfer Girl” has a pretty ace chorus as does “It’s Not The End of The World”. Too much like Guerilla though, there are a handful of songs that are just a bit off base. The last half of the otherwise upbeat “Receptacle for the Respectable” when it descends into distorted shouting is awful as is the electronic whig out at the end of “No Sympathy”… before it leads into the classy, string laden “Juxtapozed With U”. As much I try to avoid greatest hits collections, SFA for me might be more of a singles band for me. I don’t find their weirder elements to be as compelling as their straight forward indie pop songs. Having said that, used record/CD shops will continue to be a well-planned out stop in most new cities I travel to and in there, there will always be Super Furry Animal discs that need the home that I can provide…. As long as the price is right.